Before we release a list of all the winners for the 2016 Hermes Creative Awards on May 2, we’re showcasing select entries that stand out. Keep checking back to see if your work will be highlighted. Haven’t entered yet? There’s still time! Dainik Bhaskar, which means “rising sun” in Hindi, is India’s largest native language newspaper group. Dainik Bhaskar was founded in Bhopal in 1956 and has a readership of nearly 44 million people. All newspapers, of course, cover major stories, but Dainik Bhaskar decided to go beyond the headlines. During the summer of 2015, the Marathwada region of Maharashtra was reeling under a devastating drought. This resulted in massive crop failure, and the region was walloped by farmer suicides. As much as 84% of Maharashtra’s agriculture is rain-fed, which includes Marathwada, and the region that faced the worst ever drought in past half a century. The area normally receives around 780 millimeters of rainfall during monsoons, but the number dwindled to 259 in the month of June. With incessant shortfall of rain in Maharashtra, water storage in the state’s dam also hit a three-year low. Facing its third successive year of below-normal monsoon, farmers and their families who feed billions are the ones bearing the brunt, which led to a lack of consistent income necessary for their subsistence, including proper food and water for them. Dainik Bhaskar decided to help by using its influence to collect and distribute food grain throughout the stricken area. 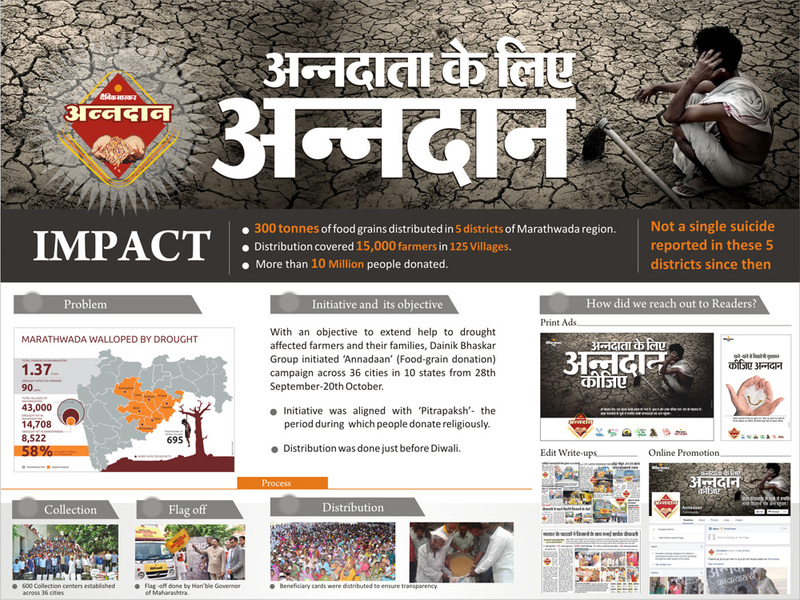 After a month-long drive, Dainik Bhaskar delivered more than 300 tons of grain to 15,000 farm families in 36 cities.